Merida (Kelly Macdonald), a versed archer and princess to King Fergus (Billy Connolly) and Queen Elinor (Emma Thompson), lives a stable, yet somewhat imprisoned life within her family’s kingdom of DunBroch. When she becomes older and more free-spirited, she inadvertently defies an ancient custom her mother forces upon her. Finding herself banished due to her erratic behaviour, she visits a calamitous witch (Julie Walters) in a moment of sheer stupidity. But, when the curse the witch enchants her with turns bitter, Merida must look inside herself and rediscover the true meaning of family. It wouldn’t be Pixar without the usual attention-to-detail that comes with the painstaking attitude their animators assume towards the visuals, and Brave isn’t one to defy this tradition. From the wide-angled scenic shots, to the inner workings of both the castle and the witch’s cottage, ensconced within the thick, moss-covered tree branches that burrow deep into the forest floor in which it resides, Brave depicts a version of 10th century Scotland as if it were ripped straight from a fairytale. Each of DunBroch’s four clans have their own specially-designed tartan, and the costumes and look of each character allow for a detailed insight into their personalities, beliefs and vices. Brave is indisputably polished to a fantastical sheen, yet under the immaculate surface it finds itself not only entrenched in Scottish mythology and folklore, but also – second perhaps only to Wall-E and Up – Pixar’s most down-to-earth and empathetic release. Where some would be nonchalant about letting narrative come second to visuals, the screenwriters here – co-directors Mark Andrews and Brenda Chapman, amongst other auxiliary contributors – ensure Brave’s narrative remains front and centre, bringing the exceptional blend of heart, wit and dark undertones Pixar fans have become accustomed to. 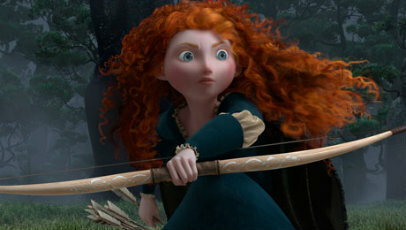 With the love-hate relationship between Merida – someone at that difficult crux between childhood and becoming an adult – and her forceful, domineering mother acting as a precursor to the other narrative threads that unravel along the way, Brave ensures that integral core is never lost, even when some of the threads and supplementary characters trail off into less-entrancing territory. Each and every character has their own separate personality and flaws, and the writers focus on how these very simple flaws and differences in opinion cause friction which, if not careful, can lead to much, much worse. It’s a laudable tactic. Rather than relying on elements outwith the well established boundaries to spur on the narrative, which could easily threaten the authenticity, everything feels cohesive and much more credible. As much as the central narrative absorbs attention, the murky territory it finds itself in towards the latter half is noticeably darker than other children’s films, and may prove too much for the younger, more impressionable members of the audience. The brief interludes of humour, mostly provided by King Fergus and Merida’s three wayward younger brothers, are a welcome reprieve, allowing the writers – and more importantly, the voice actors – to have some fun with these characters. At times, it rolls over into feeling a little childish for the overall tone that Brave establishes, but that’s a minor flaw that can be pardoned considering the wide age-range Pixar films typically appeal to. It’s not just Connolly who’s a valued contributor as King Fergus; the whole cast put their Scottish heritage to good use (while Walters fakes it admirably with a convincing accent). It all adds to Brave’s general sense of accuracy and attention-to-detail. Macdonald, in particular, is key to Merida’s success. Her incomprehensible position as an underrated actress mirrors that of Merida’s under-appreciation as an archer or person capable of making her own decisions. Connolly, Robbie Coltrane and Kevin McKidd provide decent support in their respective roles, while Thompson and Walters often come close to stealing the show from under Macdonald’s more than adept feet. Kind of wordy, but a nice review. Maybe we didn’t watch the same movie because you talk about story a lot and the simple fact is that Brave lacked one entirely.